Waking up in the morning is a struggle; the warm cosy bed is a lot more attractive than having to put effort in and getting ready. The only thing for me that makes it a little less daunting is that when I jump in the shower, I have an array of products waiting for me! That will make me feel more awake and smell amazing. The bulk of my skincare routine happens in the shower due to it being more convenient and seeing as though the rest of me is getting a good clean, why not tackle my face as well? On an everyday basis I use the Magnitone Lucid Brush with the Bliss Makeup Melt (£24), together they remove any makeup from the day before and thoroughly clean my face leaving it oil and dirt free for the day ahead. 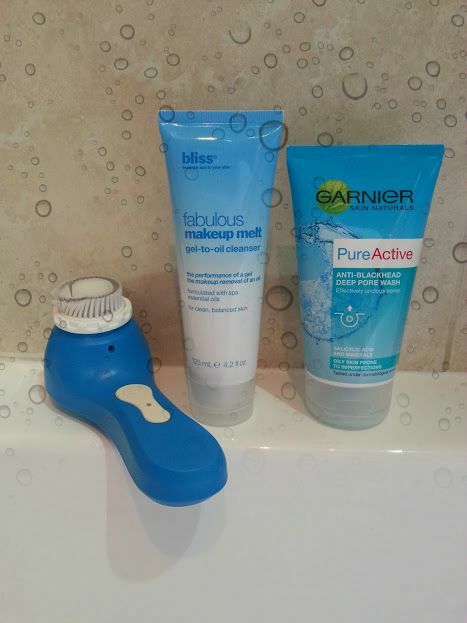 My skin is far too sensitive for a scrub every day; therefore I use the Garnier Pure Active(£2.65) only once a week. The scrub has an amazing cucumber scent and feels all tingly on the skin. After my face has been completely cleaned it’s time to move onto the body – the part that makes you feel and smell beautiful! 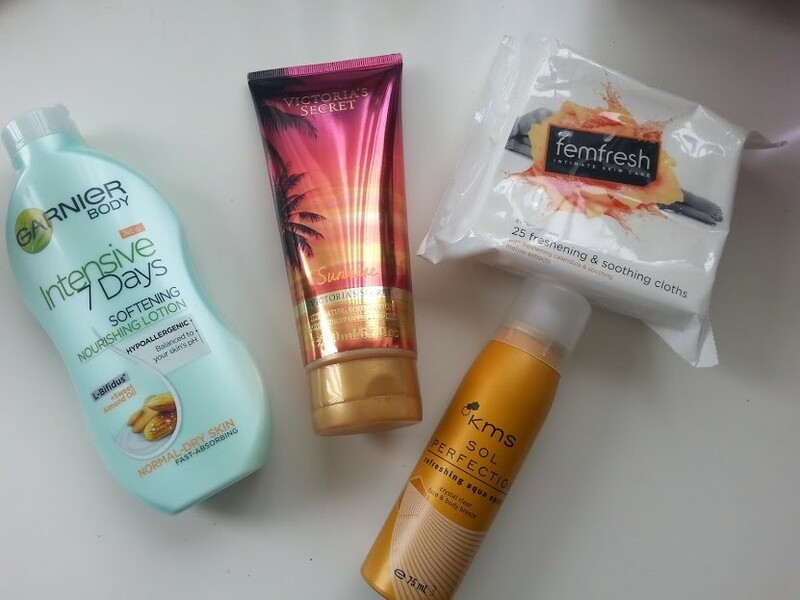 In the summer I love using products that smell fruity and are quite overpowering because then you can guarantee the smell will last. 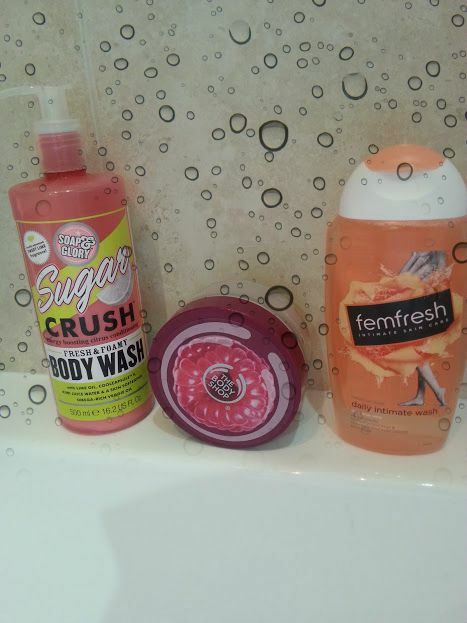 All over my body I use the Soap & Glory Sugar Crush body wash (£6.50) which smells divine! The zesty scent really wakes you up in the morning and it makes the bathroom smell great too, the entire Sugar Crush range is well worth the splurge! Every other day I use a scrub on my arms and legs to help keep my stubborn, ingrown hairs away – my all-time favourite is TBS Raspberry. It also seems like it’s been discontinued which breaks my heart. The last area I focus on in the shower is the more intimate one, it is just as important to look after that area as it is the rest of your body. For this I like to use the femfresh Daily IntimateWash (£2.99/250ml). What is femfresh? First off, it has a low pH which helps to keep the area down there calm and with it having no soap and a light scent it doesn’t irritate. The hint of Aloe Vera gives the wash soothing and calming properties, and anything with Aloe in I am drawn towards! 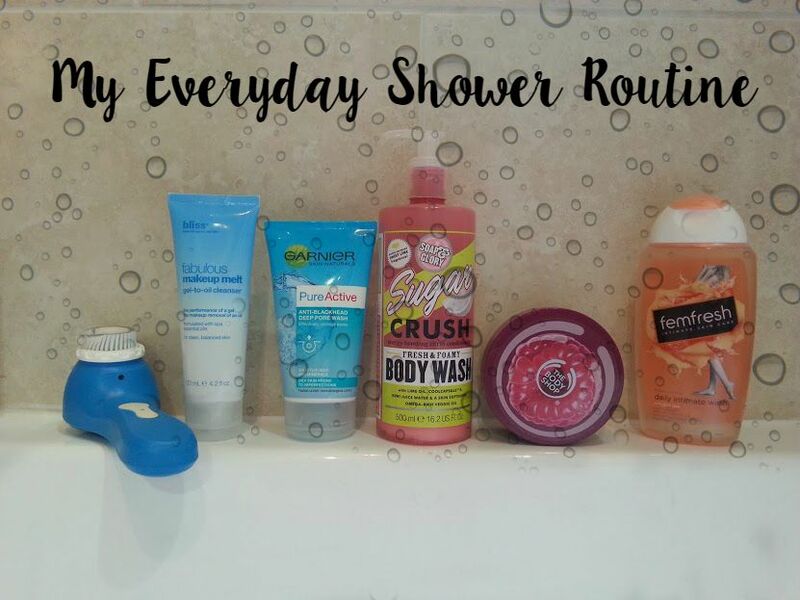 Part of my everyday shower routine includes products that I use afterwards that help me to smell amazing and feel fresh all day. It starts with a double dosage of body moisturiser, two seems unnecessary but it works wonders! First up is for the dry patches on my skin and for this I love the Garnier Intensive 7 Days (£2.45) - it restores my skin and leaves it feeling silky and soft. Then I like to use another moisturiser that smells a little better and any from Victoria’s Secret is fine for me. They smell gorgeous and the scent stays on longer than perfume does which is surprising and when night comes a hint of glitter appears too! (£9.30). During the day I love using a mist to cool me down, especially in the hot weather whilst I’m at work my body tends to heat up and a mist is the only thing that works. I grabbed this one from the Poundshop but they are now readily available in supermarkets! The other thing I use is Freshening and SoothingCloths from femfresh (£3.49), like the wash they contain a pH balanced formula that cleanses, freshens and soothes your skin. I love taking these to work with me on longer days as by the time 2 o’clock comes around I feel all sticky. These refresh me and make me feel less conscious of smelling horrible along with a spritz of deodorant of course! All of these products help me to stay fresh all day and work well together like a magical recipe to keep me fresh and clean!